2nd Lt. William Magill is shown in his F-4U Corsair. For 15 months he flew the plane on 89 missions, as represented by the bombs painted on its side. 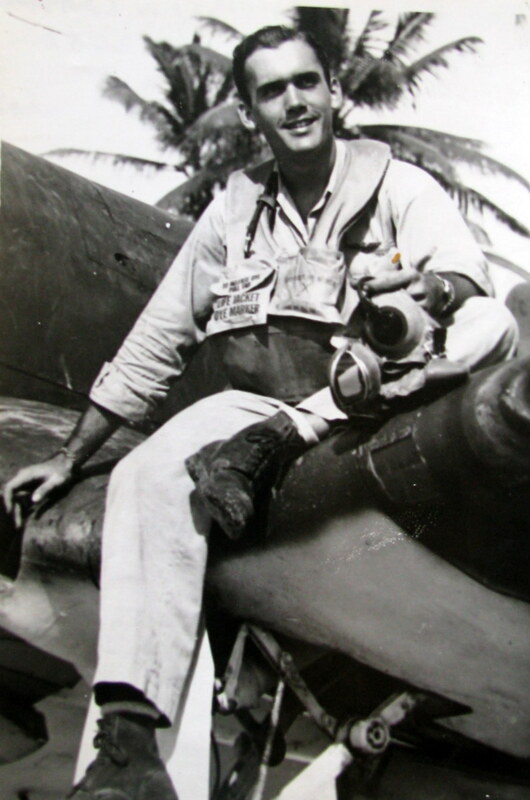 Father Bill Magill of Venice, Fla. was a “Devil Dog.” He flew a Corsair, F-4U fighter, in the Pacific during World War II before he began working for the Lord. The former Marine aviator and retired Episcopal priest was a member of Marine Fighter Squadron VMF-111. “Devil Dogs” is what they called themselves. He saw action in the Marshall and Gilbert Islands in the Central Pacific from December 1943 until March 1945. By the time his tour was finished he logged 89 combat missions. The side of his Corsair was covered with yellow bombs, one for each mission. In February 1944, Magill’s squadron was flying against Japanese targets on the Island of Jaluit in the Gilbert chain. Jabor Town was an open city on the island. They weren’t supposed to attack it. Their fighter planes were being shot at by enemy soldiers who held Jabor Town. One of the pilots in Magill’s squadron was shot down over the village. It was Christmas Eve 1944 when Magill had his closest brush with death. “We were flying over Mille Island in the Marshall Islands. Our target for the day was a Japanese gun emplacement. I was carrying two 500-pound bombs on my Corsair. I went in to drop my bombs and as I pulled out of my dive I got hit with something,” he said. “My buddy flying behind me told me I was losing oil. I called the skipper and told him I was heading for Majuro Island. It had the nearest friendly air strip. “As I flew into Majuro with my plane leaking oil, my prop froze up. I rolled to a stop on the runway with a ruined engine. Several hours later my buddy, who came in behind me, and I flew back to our home base. I had a new Corsair,” Magill explained. “I should have prefaced this story by telling you we had a magnificent liquor supply. It was the result of our squadron getting in touch with the officer in charge of overseas mess accounts in San Francisco. We took up a collection in our unit and sent him a $1,500 certified check for booze. We had the best liquor available,” he said. “One of our traditions was, if a pilot got shot down we held a party in his honor and drank up his part of the liquor,” he said. “When we returned to base (after the frozen prop incident) my buddies were partying and drinking my portion of the liquor supply. They thought I’d gone down. “Maj. Bill Clasen, commander of Marine Fighter Squadron VMF-111, was the smartest man I ever met,” Magill said. “The skipper,” as Magill referred to him, perfected a way to perform a roll in a Corsair while making a bomb run that put the ordinance right on target. Because of this aerial maneuver he originated –later adopted by other Corsair squadrons – their unit received a Presidential Unit Citation from FDR, he said. Clasen was also the man who captured the single-engine speed record by crossing the United State in a Corsair in 1946. He shaved 22 minutes off the P-51’s record. Magill says it was Clasen’s brilliance as a pilot and squadron commander that attracted Charles Lindbergh. He visited their squadron during the war. “Lindbergh knew everything there was to know about flying. He spent a month with us,” the Corsair pilot said. That was the name of William Magill’s squadron that became the picture on the cover of a photo album he kept while serving as a Marine Corps pilot 60 years ago. He was on a fact-finding mission, even though he was no friend of the president. He was a major voice in the “America First” anti-war movement before World War II. Lindbergh had scored no points with FDR because of his anti-war political stand. As a consequence, Roosevelt wouldn’t allow him to enlist in the military or grant America’s most famous aviator permission to fly military airplanes in combat. “He asked our skipper if he could come to one of our flight briefings. The skipper said yes. That was a mistake,” Magill explained. “Our skipper told Lindbergh in advance he could not fly our Corsairs because he was a civilian. After the planes took off on a raid, Lindbergh commandeered one of the extra planes and caught up to the flight about halfway to their target and tagged along. Magill was a mustang, in other words, he began his military career as an enlisted man and ended it as an officer. At 21 he was an enlisted man and a member of the 1st Marine Brigade stationed in Iceland when Pearl Harbor was bombed. He immediately signed up to become a naval aviaton cadet, something he’d always wanted to do. In 1942, when his unit was sent to Guadalcanal, Magill was posted to flight school at Pensacola, Fla. The following year he graduated a 2nd lieutenant in Marine Corps aviation. The top 3 percent of the graduating class is given the opportunity to join Marine Corps aviation if they desire. 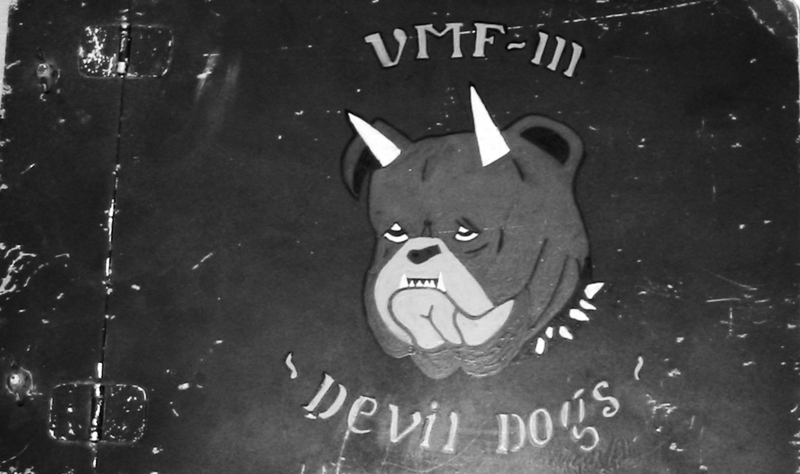 He became a member of Marine Fighter Squadron VMF-111. Becoming a fighter pilot wasn’t his first job choice. About the time Magill graduated from high school in Dallas, he told the dean of St. Mark’s Episcopal Cathedral in Dallas he thought he had a calling to the priesthood. “That brought a big chuckle from the dean,” he recalled more than 60 years later. He asked to see the bishop and received the same response when he said he was considering the priesthood as a vocation. However, the bishop told him to go to college and after graduation, if he felt he still wanted to be a priest, he would consider the possibility. A lot of things got in the way of Magill’s effort to do God’s work. He decided he would rather be a Leatherneck than a man of the cloth. And then there was World War II, where he got a chance to become a Marine aviator. After the war, Magill turned his sights to being a husband and a father. Of course, there was a question of earning his daily bread. For more than a decade, after his release from active duty in the Marine Corps, he worked in the building business and eventually he owned his own contracting firm. “I had this feeling that God was still calling me into the priesthood,” he said. There were a lot of things that happened over the years since leaving school that made him feel that way. The most vivid incident involved his dad. 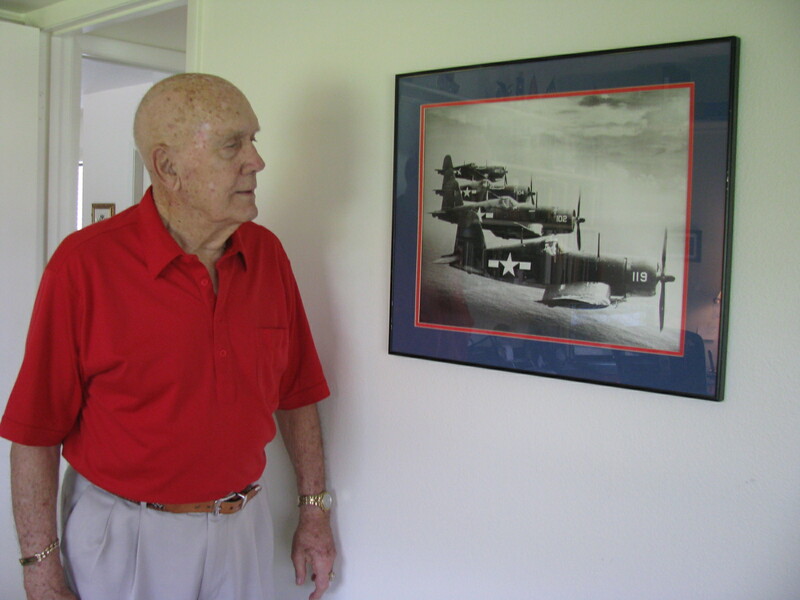 “We were flying against a heavily defended Japanese gun emplacement,” Magill said. “Our entire squadron was coming under withering crossfire from Japanese guns. I was in the third division that hit the target with 1,000-pound bombs. The plane in front of me was shot down in the crossfire. In 1960, William H. Magill was ordained an Episcopal priest. While serving as rector of St. Luke’s Episcopal Church in Denver, Colo., from 1968 to 1982, he became active in community affairs. Besides being chaplain for the Denver Police Department, Magill founded a program to help underprivileged young people in the Denver area expand their horizons by spending a week during the summer at the U.S. Air Force Academy. Then there was the “Over the Hill Gang Ski Team” Magill started for older skiers around Denver. “When I was skiing in 1976, I looked around and realized almost all the skiers were in their 20s. I decided to start a ski club. I called it the ‘Over the Hill Gang Ski Team’ for skiers over 40. It’s now the largest ski club in the world, with more than 6,000 members,” he said with pride. Age doesn’t seem to be a barrier for the retired priest. Slim, trim and athletic looking, he appears a lot younger than his is. After eight decades of living, Magill still stays connected to his priestly duties. He is an accreded interim minister. The retired priest is sent around the country to fill in where ever he is needed. In the past dozen years he’s been sent to parishes nine times as a temporary priest, spending six months to a year tending his temporary flock until the new minister arrives. 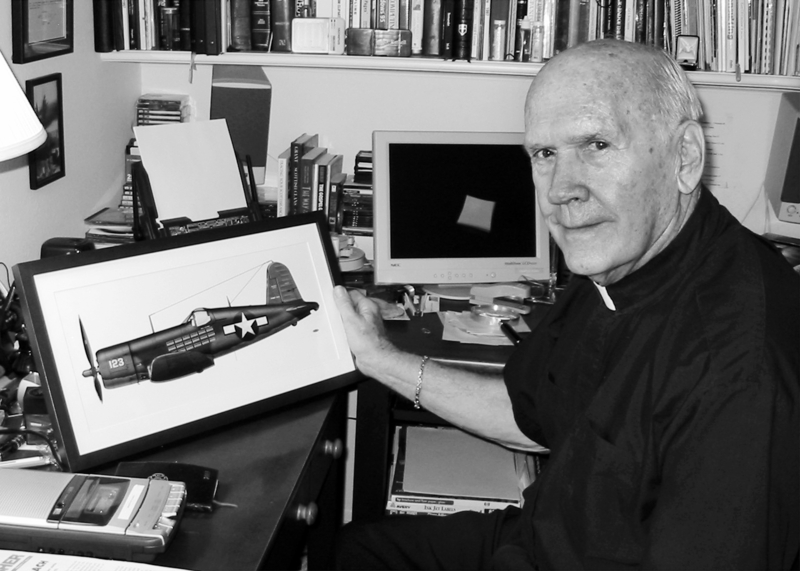 Father William Magill of Venice, Fla. holds a painting of the Corsair F4-U fighter he flew in the Pacific during World War II. The Episcopal priest had a number of close calls in his fighter before he joined the priesthood. The walls of Magill’s den in his Jacaranda home in Venice are covered with pictures, plaques and letters attesting to a life of accomplishment and good deeds. He is a man who has seen the best and the worst the world has to offer. There is considerable wall space devoted to his military career. 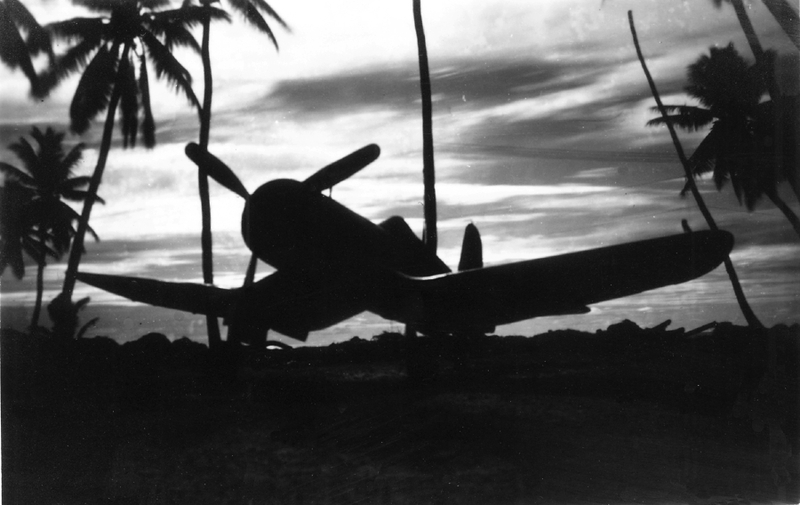 The Corsair he flew, with its 89 yellow bombs painted on the side, is captured in a painting done by an acquaintance. There are the medals, ribbons and decorations from the war and a couple of pictures of a young Magill in his fighter plane wearing his leather aviator cap and goggles. On another wall are three personal letters from former presidents Nixon, Ford and Reagan, thanking him or recognizing him for his various accomplishments. On the same wall is a DAR Honor Medal and accompanying plaque from the Daughters of the American Revolution. It was given to him for meritorious service to this country. It is one of his prized possessions. ‘”It is the highest honor the DAR can give an American. Helen Hayes received it in 1977. Gen. Omar Bradley received it in 1979, and I got it in 1978. I received it for the work I did at the military academy with the underprivileged kids,” he said. ‘There is a large watercolor still life of a golf bag, clubs, a cowboy hat and a pair of cowboy boots on another wall. It depicts a sport the priest admits his still needs the Lord’s help with after all those years and all those greens. “I’ve lived so long, I’ve had a chance to do whatever I’ve wanted to do,” the retired aviator, priest and public servant observed, opening his arms wide to the accolades that cover the walls. This story was first published in the Charlotte Sun newspaper, Port Charlotte, Florida on Tuesday, May 20, 2003 and is republished with permission. War time: 2nd Lt. Bill Magill stands in the cockpit of his Marine F-4U Corsair fighter on a Pacific Island during World War II. Each bomb painted on the side of the fighter represents a combat mission he flew. Photo provided. Bill Magill flew a gull-winged Corsair on 89 combat missions in the Pacific during World War II as a member of Marine Fighter Squadron VMF-111 before devoting his life to God. After the war, he became an Episcopal Priest with a congregation in Denver, Colo. The retired minister and fighter pilot, who has lived in Venice for 25 years with his wife, Tricia, has a few thoughts about Memorial Day and patriotism. On the last Monday in May military men and women who lost their lives in battle are remembered for their devotion to duty and country. Some say the commemoration began before the end of the American Civil War when a group of Confederate ladies placed flowers on the graves of Southern soldiers. It became an unofficial national holiday in May 1868 after Union General John Logan, commander of the Grand Army of the Republic, continued the practice in Northern states. Called Decoration Day initially, it honored only the fallen on both sides in the Civil War. In 1971 Congress passed an act signed into law by President Lyndon Johnson making Memorial Day an official national holiday honoring all of this country’s war dead. “Does Memorial Day mean anything today to the average American?” the 91-year-old retired minister and fighter pilot was asked. “I’m afraid it doesn’t. I think in order to be loyal and a patriotic you have to be taught. Today both parents work and they don’t teach their kids anything about patriotism. We have let the school system go to pot. They don’t teach history like we learned history. “We were taught to put our hand over our heart when reciting the Pledge of Allegiance. Kids today don’t know what you’re talking about. They know nothing about World War II or World War I were all about. “Kids today don’t have any real understanding of patriotism so they’re not patriotic. ”I feel sorry for my grandkids, which I have eight, and my great-grandkids, which I have nine. My immediate family has produced nine Marines starting out with me and my oldest son on down to my grandchildren. All are boys and my daughter married a Marine,” he said with a chuckle. Magill added, “I think the breakdown in our education system started with FDR (Franklin Delano Roosevelt) and all the social stuff we’re doing today. I know a Republic is one thing and a Democracy is something else. Republicans stand for the Republic which has a small government. A Democracy is what the Democrats want which is big government where few people have to work. “I’m very active in the 1st Marine Division Association that meets once a month in Englewood. I helped found the organization more than 20 years ago. At a meeting we held earlier this month a group of us was sitting around a table discussing the lack of patriotism in this country today. “I made the comment, ‘There’s not a man in this room who wouldn’t defend this country tomorrow.’ They all agreed,” he said. “I’m a loyal American. What we have in government today is not the America I fought for,” Magill added. This story was first published in the Charlotte Sun newspaper, Port Charlotte, Fla. on Monday, May 30, 2010 and is republished with permission. 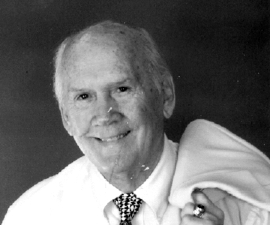 The Reverend William Hafer “Father Bill” Magill PhD, 91, of Venice, formerly of Dallas Texas, Denver, Colo. Kansas City, Mo. died Jan. 26, 2011. A Memorial Service, will be celebrated at 2 p.m. Monday at St. Mark’s Episcopal Church, Venice. Internment will be in Denver, Colo. Survivors include his loving wife of 65 years, Patricia S. of Venice; a daughter, Beverly Magill Denney of Marietta, Ga.; sons, William S. of Springfield Mo., Todd S. of Marietta, Ga.; seven grandchildren; and ten great grandchildren; son-in-law, Jimmy R. Denney of Marietta, Ga.
Father Magill was born in Oklahoma, raised in Texas and educated at Texas A & M and Nashotah House Seminary. He retired as Rector of St. Luke’s parish in Denver, Col., moving to Venice Fla. in 1985. Subsequently serving 37 Parishes in Florida as Interim, Consultant and Conflict management and mediation.. Prior to his Ordination in 1960 Fr. Bill served his country during WWII as a Marine Corps Fighter Pilot. Flying the F-4U Corsair he received two Distinguished Flying Crosses, as well as five Air Medals. He flew 89 combat missions. Father Magill is a Master Mason and a Shriner. He was Potentate of SAHIB in 1991 and Imperial Chaplain of the Shrine of North America 1981-82. He has slipped the surly bonds of earth and touched the face of God. In lieu of flowers memorial gifts to be given to Sahib Temple, Sarasota for the Children’s Hospitals.